Google is releasing a phone soon (possibly Q1 2008). It’s going to run on HTC hardware. It’s going to be sick. This we know. The overall web service integration (Google services, obviously) is going to be extremely tight. Camera -> Picasa. Compose Document -> Google Docs. Local email app -> Gmail. Etc. So they’ll present a nice “local” interface (think Gears), but the backend will tie directly to their online services. I see GPS/map integration like we’ve never seen. I think this is going to be their primary application. Not just better maps — better GPS with the maps. It’s going to be like the movies for the first time, i.e. more real-time and smooth. I see them doing some serious online syncing. All settings, contacts, etc. all being on the server side. Backing up will be automatic and transparent, and restoring will be almost as seemless as soon as the network recognizes it’s you. Google Docs is going to be insanely nice. It’s going to be the first REAL implementation of word processing on a phone form factor. Their major downside is going to be not having the hardware slickness of the iPhone. So while the OS might be incredibly awesome, stable, and efficient — the overall feel will suffer compared to the iPhone package — especially after the iPhone update. I see cost being around $250-$350 — purposely way below iPhone. Overall? Google will have the features that Apple wished they had — most of which will hinge on their strong web services presence. 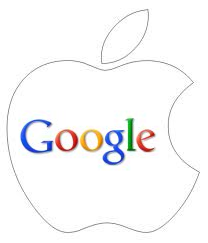 But Google will still envy Apple’s monopoly on lust. The overall package of the iPhone (especially after the update) will make it VERY hard for people to leave it once they’ve experienced one. But the same will go for anyone who gets used to the features on the Google phone. It’s going to become a matter of which you get spoiled on first.